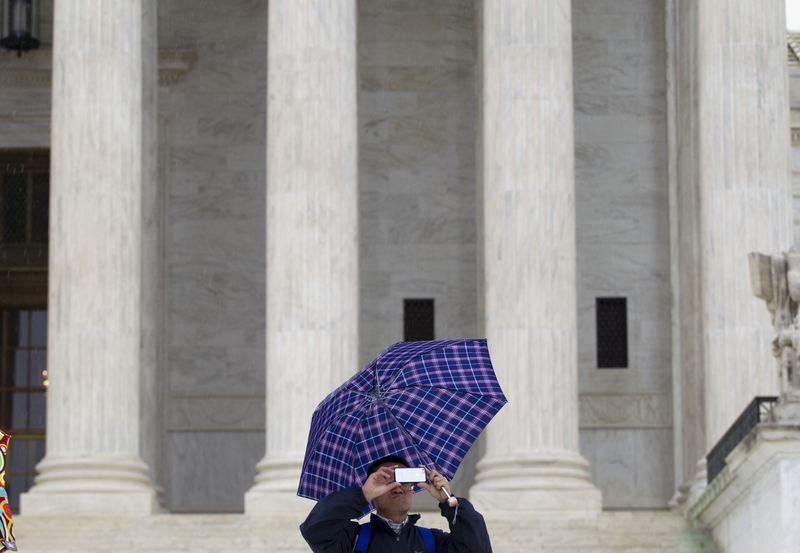 A Supreme Court visitor takes pictures with his cell phone outside the Supreme Court in Washington, D.C., Tuesday. WASHINGTON – Warrantless smartphone searches worried Supreme Court justices Tuesday, with several challenging law enforcement intrusions on privacy. In a high-tech case that goes well beyond its San Diego origins, liberal justices in particular seemed poised to limit what police may do with iPhones and similar devices taken during arrests. “Most people now do carry their lives on cellphones, and that will only grow every single year as, you know, young people take over the world,” Justice Elena Kagan noted. At the same time, pointed questions from conservative justices and persistent probings by Justice Anthony Kennedy, frequently a swing vote, hinted at a difficult split decision ahead. “Smartphones do present difficult problems,” acknowledged Justice Samuel A. Alito Jr., a conservative who often sides with law enforcement. The California smartphone case heard Tuesday, along with a somewhat different case involving a Massachusetts cellphone, brought justices face to face with devices that are banned from the courtroom itself. Most everywhere else, the phones are omnipresent and ever more powerful as far as range, capacity and utility. Myriad applications, or apps, provide virtual access to medical, financial and personal records. Global Positioning System data is routinely stored, providing electronic footprints to past locations. Justices on Tuesday repeatedly noted the power of the technology, hinting that it will color their decision. The California smartphone case started when a San Diego police officer pulled over David Leon Riley, 23, on Aug. 22, 2009. Police impounded Riley’s Lexus because he had been driving with a suspended license, and in a subsequent search they found two guns. A police officer checked Riley’s unlocked Samsung Instinct phone, and found video clips of gang initiation fights, pictures of gang signs and clips of a red Oldsmobile allegedly used in an earlier gang shooting. Convicted on charges that included attempted murder, Riley was sentenced to prison for 15 years to life. “Even if we’re in a world where the police can seize some evidence and keep it and use it for the prosecution … there are still very, very profound problems with searching a smartphone without a warrant,” said Riley’s attorney, Stanford Law School professor Jeffrey L. Fisher. California officials countered that police need to be able to conduct searches, regardless of the format. “The consequence of carrying things on your person has always been that if you are arrested, the police will be able to examine that to see if it is evidence of crime,” California Solicitor General Edward DuMont said. Kagan was among the skeptics. In Brima Wurie’s case, Boston police lacked a warrant when they quickly checked the call log on his gray Verizon LG phone after arresting him on drug and gun charges. Wurie was convicted in 2009 and is serving a 262-month prison term. The cases will force the court to update the rules governing post-arrest searches and their compliance with the Fourth Amendment’s ban on unreasonable searches and seizures.